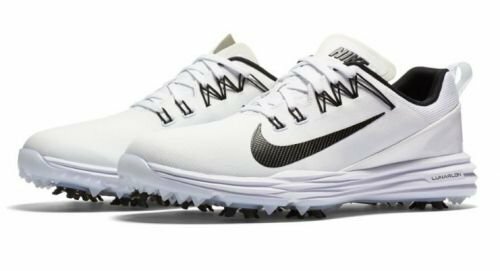 Featuring Flywire technology and Lunarlon foam, Women’s Nike Lunar Command 2 Golf Shoe provides lightweight cushioning and a locked-down fit. It features a technical TPU midfoot shank for enhanced ground feel on a variety of surfaces. Flywire technology integrates with the laces for a dynamic, supportive fit. Aggressive outsole design delivers green-friendly traction for a variety of conditions. Textile upper is lightweight and durable. Midfoot shank made from technical TPU helps generate a light and stable feel. 7 removable CHAMP® PiviX golf spikes twist and lock into a CHAMP® SLIM-Lok system for exceptional traction and enhanced ground feel on a variety of surfaces. Top Schuh, absolut wasserdicht. Kann ich nur empfehlen! Sehr gute Passform, wie bei fast allen Nike Schuhen und sehr bequem.